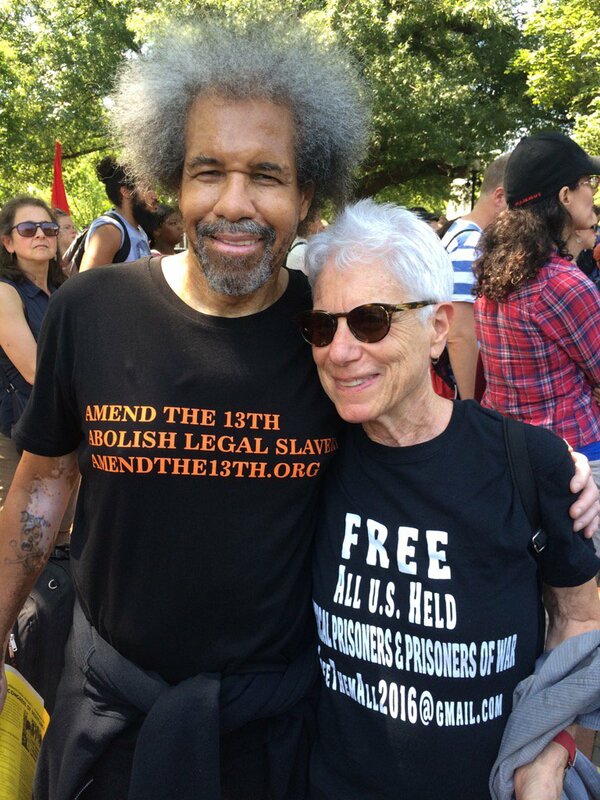 Albert Woodfox of the Angola 3, who was held in solitary confinement for over 40 years, was a speaker at the main march across from the White House in Washington, D.C. Laura Whitehorn, also formerly a political prisoner, stands beside him. Albert’s T-shirt was made for him by famed prisoner supporter Annabelle Parker in The Netherlands. 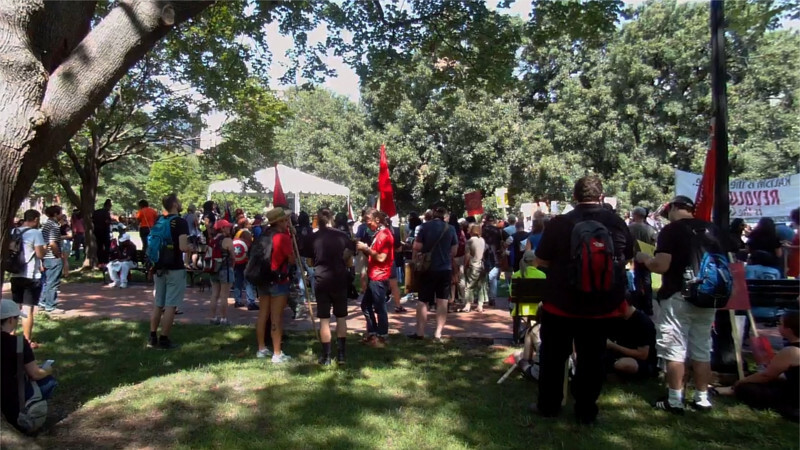 Called by prisoners to give voice to their demand to strike the slavery clause from the 13th Amendment – making slavery legal “as a punishment for crime,” thus legally holding 2.3 million imprisoned Americans in slavery today – thousands turned out in as many as 16 cities in the middle of Black August, on Aug. 19, 2017, to abolish slavery and end mass incarceration. Here are two initial reports from the main march in Washington, D.C., and the solidarity march in San Jose, California, where about 200 marched over a mile from a park to the county jail for a rally with powerful speakers who saluted the prisoners and inspired the crowd. On the 19th of August, Millions for Prisoners marched on the White House and held a rally demanding an end to what one speaker called the “Confederate” jail and prison system, in which prison labor for 50 cents per hour is essentially slave labor backed by punishments. Many speakers called out the origin of U.S. police departments in the slave catchers of old, and pointed out that the intensive policing of Black and Brown neighborhoods is still catching slaves for the plantations to this day. The prison system itself was called the New Plantation. Many speakers called out the origin of U.S. police departments in the slave catchers of old, and pointed out that the intensive policing of Black and Brown neighborhoods is still catching slaves for the plantations to this day. The two main demands of the rally were amending the 13th Amendment to the U.S. Constitution that explicitly permits “slavery and involuntary servitude” as punishment for a crime with the word “except” in the general prohibition of slavery, and holding congressional hearings on recognizing that exception as a violation of international law and the general principle of human rights. Without this exception to the 13th Amendment, the whole prison-plantation model would be illegal under the rest of the same amendment. A speaker from Leonard Peltier’s support committee read out a statement of solidarity with Mumia Abu-Jamal written by Leonard. Another speaker reminded the audience that the entire Florida prison system cancelled all visits for this weekend, saying this proves the power of the movement and that the enemy fears the people. The Florida prison system had claimed they feared an uprising timed to coincide with the march. This story first appeared on DC Indymedia, at http://dcindymedia.org/node/1620. March and rally for prisoners’ human rights in San José, Calif. Hundreds marched and rallied in San José, Calif., Aug. 19, at a sister action for prisoners’ human rights to the main one that took place the same day in Washington, D.C. California Prison Focus and the united-front coalition Rise Up for Justice were the main co-sponsors and organizers of the action. Participants set off on a 1.3-mile march, whose route included a community known as Japantown. Tourists and other patrons in the patio area of a neighborhood restaurant spontaneously broke into applause as the chanting marchers passed by. The march route also included First Street, along which a half dozen or so widely hated bail bonds outfits have their offices. Because the march was led by Williams and a number of other parolee ex-prisoners whose security was paramount, the march did not stop to denounce these vultures. 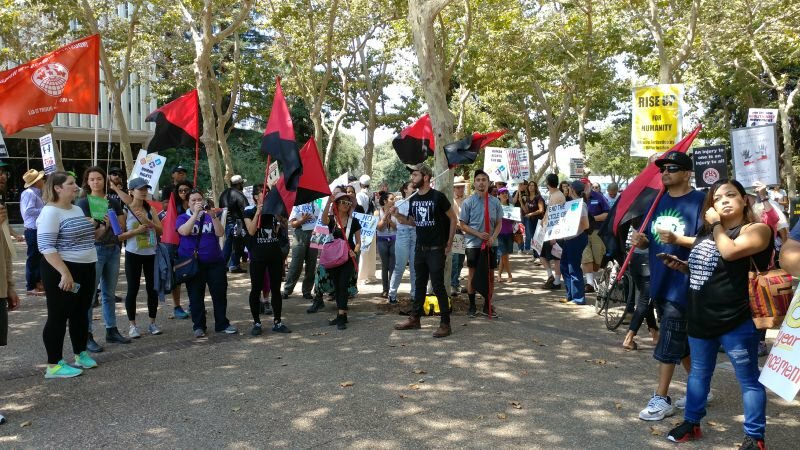 The march concluded with a lengthy but spirited rally at the Santa Clara County Jail, which included a minute of silence for the prisoners inside. Nube Brown of California Prison Focus and Rise Up for Justice, along with Troy Williams, chaired the rally. Many former prisoners presented heart-rending stories of the injustices they experienced in prison and after being released. Among these, former Black Panther Dorsey Nunn, executive director of Legal Services for Prisoners with Children, appealed to the audience to call California Assembly members to pass AB 1008, the Fair Chance Act, which would “ban the box” asking about one’s prison record on job applications. Bato Talamantez, one of the San Quentin Six and co-founder of California Prison Focus, spoke near the end. He noted that few of the veterans of earlier struggles, such as Hugo Pinell, also one of the San Quentin Six who remained unbroken through 46 years of solitary confinement and 51 years of incarceration until he was murdered on Aug. 12, 2015 – allegedly by two white prisoners at the behest of guards with grudges – were still alive but urged the younger generation to carry on the fight for human rights. 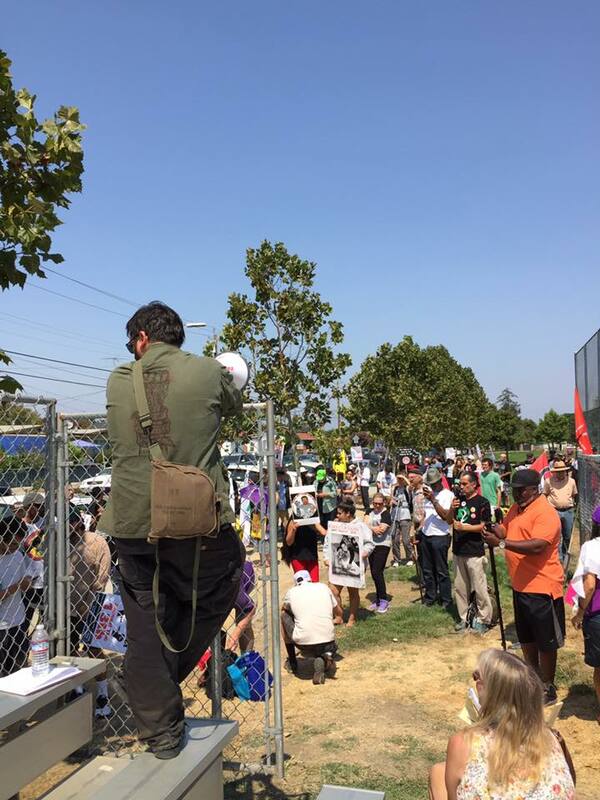 This story first appeared on Liberation News, the newspaper of the Party for Socialism and Liberation (PSL), at https://www.liberationnews.org/march-rally-prisoners-human-rights-san-jose-calif/?utm_source=one_signal&utm_medium=desktop_alert&utm_campaign=liberationnews. Bay View staff contributed to this story. This speech by Heshima was recorded from prison over the phone for the Millions for Prisoners Human Rights March on Aug. 19, 2017. For more information, visit https://amendthe13th.org. Leonard Peltier remains an unrepentant double murderer. Until he shows contrition and asks forgiveness from his victims' families, he should stay where he is. One opinion . . . an opinion only . . .